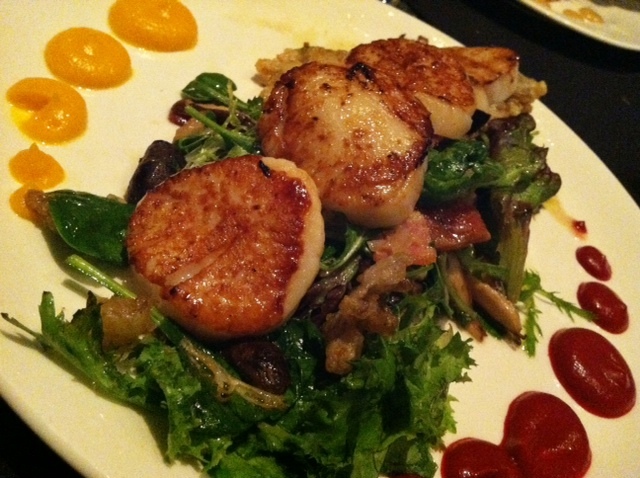 I recently had the pleasure of trying out a new-ish restaurant, in downtown Nashville. 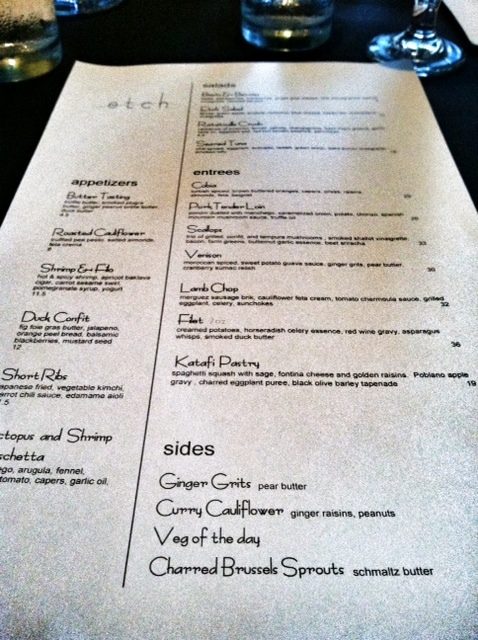 Etch opened at the end of last summer and although I am not sure what took me so long to try it, I am sure I will be going back again. First thing is first. I will get the thing I didn’t like about the restaurant, out of the way so we can move on to more positive experience-shall we? Etch is in no way relaxed. I have a laid back approach to food and like to enjoy it in an environment where I feel comfortable to throw a leg up while my shoe sits alone on the floor and my bare foot sits under my other leg. You probably won’t want to do that here and I tend to enjoy restaurants where you can. Excited laughing and bantering with friends will probably get a few funny looks from other diners dressed in the usual “I just left a business meeting and came to dinner” garb. If you like that type of environment, then you are most certainly, in luck. If you don’t, try to suffer through it because the food is well worth it. Moving on……We were cheerfully greeting by 3 hostesses that were all accommodating and welcoming. They were also friendly as could be on the way out. Our server, Kenneth, was decidedly wonderful from the moment we sat down. He was knowledgeable and enthusiastic about the menu and gave specific (ingredient) descriptions of each meal we ordered. His passion for food was really so evident and appreciated. They had a short but varied (by the glass) wine list that I can’t comment on because they happened to have my favorite beer (Turtle Anarchy Portly Stout) on tap and I was in the mood for that. Octopus and Shrimp Bruschetta: The octopus in this was so amazing that I found myself really wishing that it was only octopus. 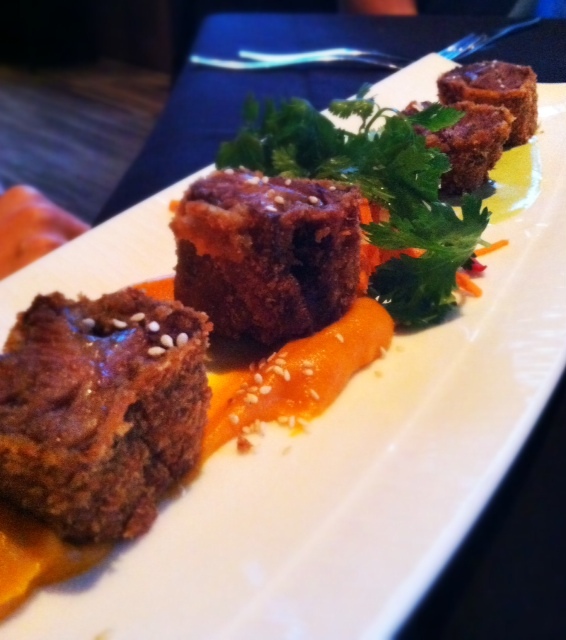 Fried Short Rib App: A must order. 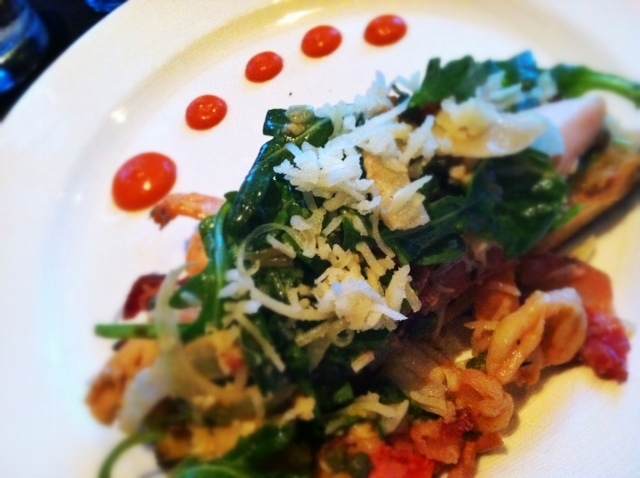 Fancy comfort food on a plate. Creative while still being familiar. 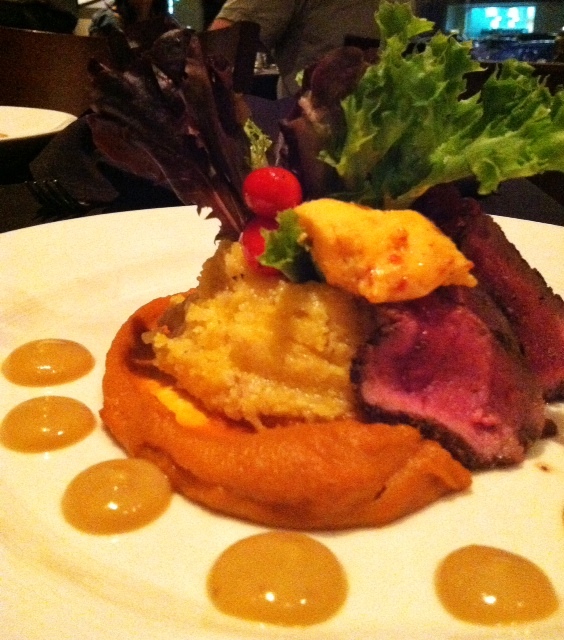 Venison: I thought this was the most interesting dish on the table all night. The flavors (cranberry relish, Moroccan spices, sweet potato) were sort of like Thanksgiving, in a really good way. The venison was not gamey at all and instead tasted like a very tender filet. Absolutely amazing. This dish gets a 10. Pork Tenderloin: This was my second favorite 🙂 It almost resembled Marsala, but it was even better. 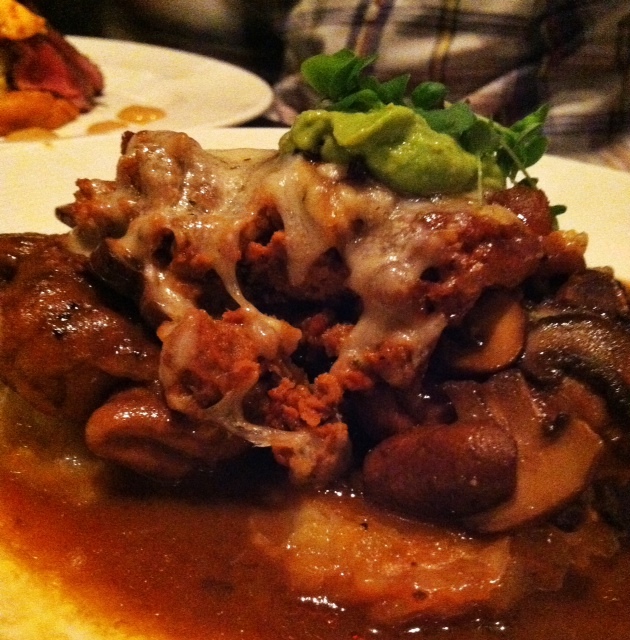 The mushroom sauce and the chorizo were exotic and I would definitely consider ordering this next time. The tenderloin was cooked perfectly and you could cut it with your fork. Scallop Entree: The greens were great and the scallops were cooked perfectly, but the fried mushrooms made this dish too oily and I was wishing they weren’t there. (Least favorite entree but still delicious) Those red dots? Those are beet sriracha. Yum. 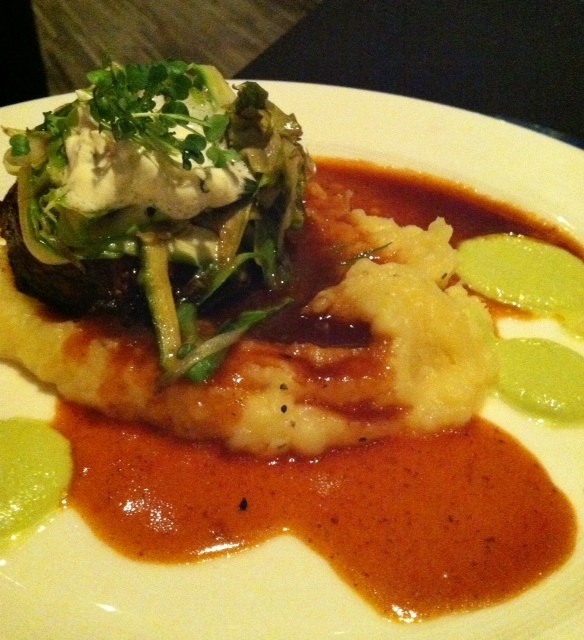 Filet: I wasn’t surprised that they had a terrific filet. The red wine gravy was awesome. I am not a fan of mashed potatoes but these were some of the best I have ever had. Topping things with duck butter, never hurts either. I give Etch 8 1/2 apples. I will definitely be returning. Thanks for the fabulous food and A+ service!